The Jonesboro Regional Chamber of Commerce requested the Interstate 730 designation for the upgraded stretch of Highway 226, between the U.S. 67 freeway and Interstate 555 in Jonesboro.1 Highway 226 travels 12.2 miles east from U.S. 67 to U.S. 49 at Gibson. The remainder of the route utilizes U.S. 49, a surface route extending 6.0 miles east and north to a parclo interchange with Interstate 555 & U.S. 63. 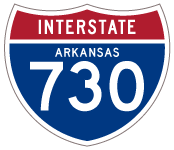 The proposed for route I-730 is part of High Priority Corridor 52: Arkansas Highway 226 from U.S. 67 to U.S. 49. Highway 226 between Cash and Gibson, Arkansas in 2013. Grading appeared for both the Cash Bypass and Highway 49 Connector along the Highway 226 corridor west of Jonesboro in 2013. The Cash Bypass project was let January 2013. The Highway 49 Connector was let December 2011. Widening of Highway 226 between the two roadways was let in separate projects in September 2012 and November 2012. Plans to widen Highway 226 to a four-lane route from U.S. 67 east to U.S. 49 consisted of upgrading existing Highway 226 to an at-grade route and building a south bypass of Cash. This widened stretch ties into a new 1.8-mile alignment (Highway 49 Connector) from Highway 226 southeast to U.S. 49 at Gibson. Originally the chamber of commerce requested that the corridor be freeway-grade, but the route was built at-grade instead. October 2012 – 4.0 miles of Highway 226 completed from U.S. 67 east to the Cash Bypass at a cost of $15 million. Late 2015 – 1.6 miles of Highway 226 along the Cash Bypass at a cost of $6.3 million. Late 2015 – 5.1 miles of Highway 226 from the Cash Bypass east to the Highway 49 Connector at a cost of $45.3 million. June 23, 20164 – 1.7 miles of the Highway 49 Connector from Highway 226 southeast to U.S. 49 at a cost of $18 million. I-730 was never approved by AASHTO, and furthermore was premature as Interstate 30 was not assigned to the U.S. 67 freeway (I-57 was formally proposed for the route in 2016). Highway 226 ties into U.S. 49 at Gibson on the rural outskirts of Jonesboro. U.S. 49 turns east from there along an increasingly suburban route to Valley View and the Interstate 555 & U.S. 63 freeway at Southwest Drive. Substantial upgrades would be needed for U.S. 49 to upgrade it to limited access standards. A parclo interchange joins Highway 226 with U.S. 67 in a rural area to the east of Swifton. This junction would need upgrades to become a full freeway to freeway interchange. “Chamber plans D.C. visit to discuss area’s concerns.” Jonesboro Sun, February 15, 2003. IDrive Arkansas (AHTD) web site. “Neighbors excited for Highway 226 bypass to open.” WMC, June 21, 2016. Page updated June 22, 2016.